Welcome to Massage by Jen! Over 10 years experience providing massage for pain relief and relaxation. and the Belavi (Bellanina) Facelift Massage. · Belavi/Bellanina Facelift Massage~ a 90 minute deluxe, pampering facial massage with anti-aging benefits. See www.belavi.com for more info! I trained at the Medical Arts Massage School in Raleigh, North Carolina in 1999. The school was run by a Physical Therapist who had run his own chronic pain clinic. The training was very outcome based and focused on helping people in pain to feel better. 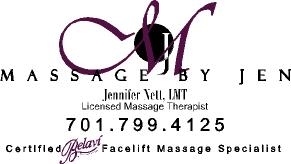 I am licensed in North Dakota and a member of the AMTA (American Massage Therapy Association). I am also a graduate of Concordia College, Moorhead, MN with degrees in French and Business.